After graduating Waseda University in 2009, I joined Daiwa-SMBC (Second biggest Venture Capital in Japan). Currently, I work at an Incubate Fund (36M USD fund with a strong sector focus on mobile, social, and web services expanding on a global scale) from 2011 as a project leader of Incubate Camp which supports/invests in younger entrepreneurs,mainly in their 20s. I've also played tennis for 6 years. I had a wonderful lunch with Yoshihiko. We had lunch near a nice office park and beautiful park in Roppongi. 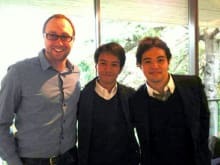 Yoshihiko is a very friendly guy who was more than happy to share his knowledge and experiences working in the finance and startup worlds in Tokyo. I learned a lot and hope to meet him again!